If you know where you're going for dinner and have a few extra minutes, find the restaurant's menu online and check it out. If you do a little research beforehand, you'll be more prepared, and you'll probably make better choices. A lot of chain restaurants have their nutritional info online -- but even if the restaurant you're going to doesn't have that information available, you'll still be able to make smarter ordering decisions if you scope out the menu options in advance. HG Tip: Check out healthydiningfinder.com. When you sit down, scan the menu for the best options -- look for words like "grilled", "steamed", "broiled", and "baked". Skip stuff with words like "fried", "breaded", and "sautéed". And avoid sauces that sound sugary, cheesy, creamy, and/or buttery. A tomato-based sauce, soy sauce, salsa, or a squirt of lemon is a much better bet for a meal topper. Believe it or not, you're probably better off ordering a grilled steak (typically considered a high-calorie meat) than you are ordering low-cal fish that comes swimming (no pun intended) in some calorie-packed creamy goo. Appy Days Are Here Again! No need to skip the appetizers. In fact, if there's a broth-based soup on the menu, go for it. Studies show that starting a meal with broth-based soup could actually cause you to take in about 20% fewer calories overall during that meal. Why? 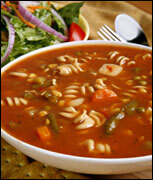 Because soup fills you up -- and it's fairly low in calories! Other great apps include salads (with light dressing or a splash of lemon or balsamic vinegar), shrimp cocktail, and steamed clams or mussels (in broth or wine, not butter). We're not sure how much more clearly we can put this. SKIP THE BREAD. Don't look at it, don't sniff it, don't pick at it. Okay, unless you have INSANE self-control and can stick to one small, plain, butter-free piece. But we've heard that the typical pre-meal bread-eater tends to gobble up about 500 calories' worth of bread and butter BEFORE their meal even starts. OY! We say, tell the bread guy to keep his basket, and skip that carby starter altogether. Just make sure the other people you're dining with agree, of course! We're big believers in dessert-eating. But since most restaurant sweets are LOADED with calories (making it too easy to go overboard, even if you split one with a pal), ordering them can be risky. If you're the type who won't be satisfied with just a few bites, try NOT to order anything too decadent. 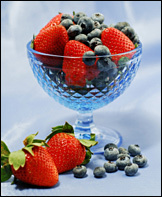 Decent options include sorbet and biscotti, and your best bet is always fresh fruit (like a bowl of mixed berries). And here's a little tip -- even if the dessert menu doesn't list fruit, ASK. Another way to get a guilt-free sweet fix is to just have some tea or coffee, and then head home for an HG-friendly dessert -- like one of our EZ No-Bake Desserts or a VitaTop. Yum! And if you can't wait 'til you get home, stash some Splenda Flavors for Coffee in your purse (with flavors like Caramel and French Vanilla, they'll turn ordinary coffee into a more decadent drink). Low-cal hard candies are also great for discretely taming your sweet tooth at the table (at least 'til you get home to your goodies!). * Don't starve yourself before a big meal out. You'll only wind up ravenous and less likely to make smart decisions when ordering (not to mention more likely to inhale the bread basket!). 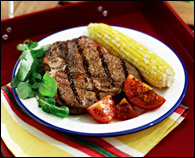 * Look for entrées that are full of lean protein and veggies. They'll fill you up more than a starchy meal, like a bowl of pasta. * Don't go cuckoo with the cocktails. Not only are they full of empty calories, but also it's much harder to turn down that triple chocolate cake when you're tipsy. * Don't be afraid to special order (for example, requesting the grilled salmon minus the creamy sauce). Just ask nicely! * If the restaurant can't accommodate your requests and the entrées on the dinner menu aren't diet-friendly, get creative! Order an appetizer of shrimp cocktail with a big dinner salad (instant seafood salad with spicy cocktail dressing!). Or order a side of steamed broccoli, a small baked potato with salsa, and a chicken skewer appetizer (that's a full meal right there, and totally guilt-free). April 11th is National Cheese Fondue Day. Celebrate gleefully with our Nacho-rific Cheese Sauce. Mmmmmmmm! Share this email with people you know and like. Click "send to a friend" ASAP! ***The PointsPlus® and SmartPoints® values for these products and/or recipes were calculated by Hungry Girl and are not an endorsement or approval of the product, recipe, or its manufacturer or developer by Weight Watchers International, Inc., the owner of the PointsPlus® registered trademark and SmartPoints® trademark.